A Century of Green Bench History Park Benches, Outdoor Benches, Comfortable Benches, Made from recycled milk jugs, Eco-Friendly Outdoor Benches in a Variety of Colors. Al Lang, elected mayor in 1916, passed an ordinance that required all benches to be both green and of a uniform size but it took until November of 1917 for the bill to pass. 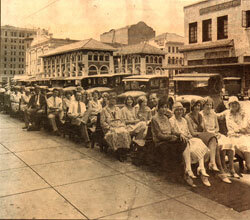 That of course makes this year the 100 year anniversary of the World Famous St. Pete Green Bench. 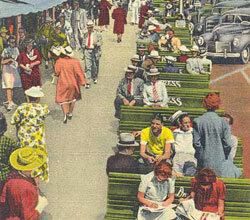 The original benches were olive green and eventually were forest green. 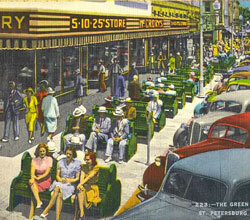 In 1969 the benches were removed because of the negative image St. Pete had as "God's Waiting Room". Good design prevails over fashion: the benches are popular again thanks to comfort and ageless style that isn't matched by most "modern" designs. GreenBenches & More hs been crafting faithful replicas of the benches since 1983 and updated to recycled material when durable high-quality HDPE "timber" had proven itself.